From left to right: Zina Prokofyeva, Sameerah Moharb, Sakuntala Chhetri. 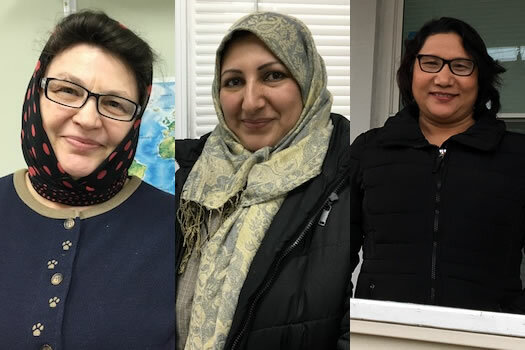 This week we're sharing the stories of a handful of refugees who have found new homes in the Capital Region. One of the most immediate challenges for many of the refugees making a new life here is learning English. It's an obstacle not only for getting a job, but also connecting with the wider community. We talked with three people who are working through this challenge. Zina Prokofyeva is a former librarian from Ukraine who would like to work. She came to Cohoes more than two years ago to be with her family, and she's still looking for a job. Why did you come to this area? I came because my son is in America and he invited us. He lives in Georgia State. He moved there from Cohoes. He works in Georgia. And I and my husband lives in Cohoes. Our English is not good. No, because in Ukraine is war and the life is very difficult. But I have a sister in Ukraine, but that is all. I want to go to work here because sometime I need money. I work 25 years in the library in Ukraine and then I work as accountant for a little company. I move here two years and a few month, but I like here because my kids is here and American life is good life. What surprised you about America? I think American people is very friendly people. In Ukraine is not friendly. Is difficult because in Ukraine medicine is very expensive and here medicine is free for us. I have small car but I look for a job. Because my English is not better I don't find a job. I have friends in Albany and Cohoes -- I have Ukrainian church. Sameerah Moharb came to the United States from Iraq more than three years ago with her husband, two sons and her daughter. She is still working on her English at the RISSE program. The family chose the US because they heard from others that it would be a good place to live, and she was pleasantly surprised by the kindness of their neighbors. "People have been welcoming," she says. "Come to visit me." She's still finding the language a challenge, but she has hope. "I hope future for children better. I hope their English good and they go to a job. I told all the people come to America because life here is better. I like Albany. Anything is good, it's all good." Sakuntala Chhetri came to Albany nearly two years ago from a refugee camp in Nepal, after fleeing her native Bhutan. She's currently taking English classes at RISSE. Because in my country there are many many troubles. They didn't like Christian people and Hindu people and there was fighting. I am hoping is good job. I want to do good learning English and I will get a great job. What did you do in Bhutan? I worked at a small hotel. Here? I don't know... anything. I like this country because is beautiful country and beautiful people. I like these rules and regulations here. In Nepal there is no rule. All my family member is here in the United States. My kids are here. My husband is dead in Bhutan. But I have here three children -- two daughter and one son. This is my home now. I miss my friend in my country. And my grandparents are still in Bhutan. My parents are here. My brother and sister are here. I live in Albany now. What do you want people to know about refugees? I think refugee is... they cannot speak English and they must learn good English. Anything else you want tell people? Yes... tomorrow I have interview for job* and I am excited. At Albany Medical. If I pass this interview then I will get the job. I am going through citizenship process. * We checked back with RISSE and Sakuntala got the job at Albany Med.